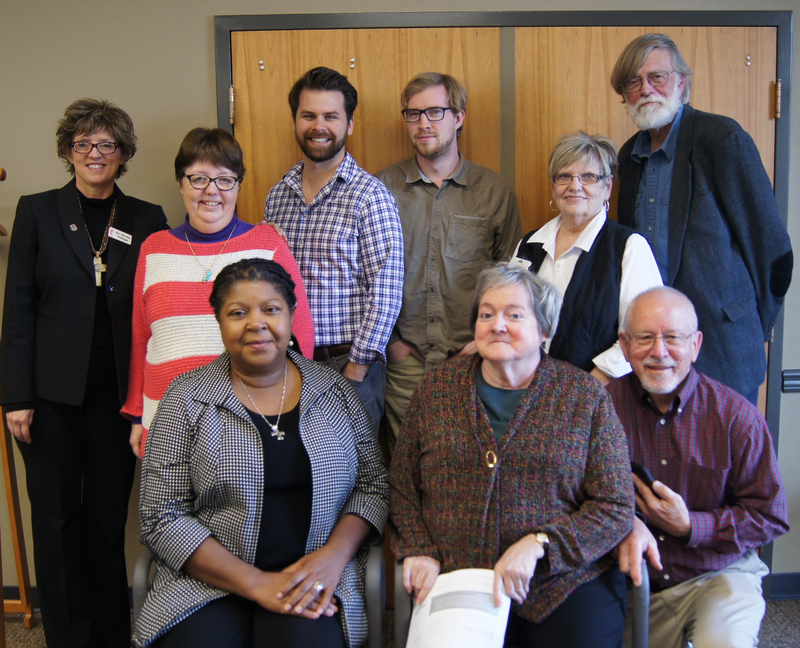 Nashville Episcopal Area clergy and laity are continuing their efforts in the fight for affordable healthcare in Tennessee. The report below outlines what they will be facing in the years ahead and how you can get involved. Please pray for those who fall in the coverage gap as well as those advocating for them. United Methodists at a coalition meeting of those advocating for affordable healthcare for all. A coalition of community members from various nonprofit, public policy, and faith-based groups throughout the state gathered at the Tenn. Primary Care Association on Monday, Nov. 14, to discuss the future of healthcare in Tennessee, specifically the challenges ahead for TennCare, the Affordable Care Act and closing the coverage gap. The Rev. Merrilee Wineinger, Coordinator of Faith that Heals Ministry at TN United Methodist Conference, was an active partner at the healthcare coalition meeting. Alongside Wineinger, representatives from the Tennessee Justice Center, American Heart Association, American Cancer Society, Tennessee Health Care Campaign, Nashville CARES, Mental Health America, National Healthcare for the Homeless, and fifty others were in attendance to discuss the future of Tennessee’s healthcare. The current healthcare atmosphere is on shaky ground after Donald Trump’s election, running on promises to repeal President Obama’s Affordable Healthcare Act once in office. Tennesseans are fortunate to have U.S. Sen. Lamar Alexander, who chairs the powerful Senate Health, Education, Labor and Pensions Committee, which will play a key role in shaping the broad changes planned by the Trump Administration and the new Congress. Gordon Bonnyman of the TN Justice Center noted that much of the Affordable Care Act is likely to be repealed early in 2017, and it is vitally important that it be replaced by reforms that will work for all Americans. He warned the attendees that all current health care programs, even Medicare, the Children’s Health Insurance Program and Medicaid that covers over 1.3 million Tennesseans, face radical cuts and reforms. Speaker of the House Paul Ryan has announced a desire to cut domestic spending and curtail federal health programs. Tony Garr of the Tenn. Healthcare Campaign, explained that Medicaid, known in Tennessee as TennCare, is currently an entitlement. This means citizens who meet specific criteria for eligibility have a right to participate and their coverage is protected by federal law. The federal government appropriates two-thirds of the funding as necessary to cover costs, as opposed to a fixed cost. Tennessee pays the other one-third of the costs. Block grants have been proposed as an alternative to reduce the rising cost of healthcare, and to give states more power over the program, a proposal that Garr opposes. Garr argued against block grants by presenting facts unknown to most constituents, such as the crucial role TennCare plays in covering over half of live births in Tennessee and more than half of nursing home care. Under a block grant, federal payments would be limited, leading to continuing cuts in the program as health care cost continue to rise, and as the population increases. Control of the program would be given to the Tennessee legislature, and it is unclear who would be covered under a block grant. Some 300,000 working Tennesseans who are in the health insurance “coverage gap” would likely remain uninsured. Currently, about 60 percent of those on TennCare rolls are working. Proposed new work requirements could result in loss of coverage for the other 40 percent in the coverage gap including adult students, the disabled and those tending to disabled family members in their homes. The Rev. Marie C. King, Chair of the TN United Methodist Conference Health and Welfare Committee, added her faith-based perspective. “I want to encourage church leadership to educate the community on the discussions currently taking place in healthcare reform. Tennesseans need to educate themselves on what is happening and we need to support our congregations on this important policy issue as the Founder of Methodism John Wesley taught us,” said King. To learn more about enrolling on the healthcare marketplace, visit getcoveredtenn.org. To keep up with changes affecting our health care, and to learn how you can become involved as an advocate for our most vulnerable neighbors, contact the Tennessee Justice Center at tnjustice.org.